I have been working with Artificial Intelligence (AI) and machine learning since my graduate school days back in the early 90s where I used neural networks and pattern recognition techniques for prediction, coordination, and control applications. In 2003, I built a software platform called GridAgents™ which was based on multi-agent technology to allow nodes (machines, devices, or anything) to utilize software agents that could self-configure, coordinate using peer-to-peer messaging, and autonomously complete complex tasks based on AI and machine learning. GridAgents demonstrated early applications of the Machine Economy, where agents represent machines and things and optimization was done via buying and selling behavior. Overall, the GridAgents platform was designed to enable decentralized control systems and transactive machine-to-machine (M2M) systems. Agent / An agent is a computer system that is capable of flexible, decentralized, autonomous action in dynamic, unpredictable, typically multi- agent domains. As an example in 2008, we modeled the entire Manhattan electrical grid working with Con Edison where GridAgents were created to emulate many of the electrical distribution automation system and GridEdge components such as transformers, switches, relays, protection devices, distributed energy sources as well as energy systems in buildings. We were able to successfully virtualize many of the SmartGrid elements and could automatically notify buildings which were close in proximity to overheating transformers located underground in order to automatically turn off non-critical loads and avoid costly early transformer replacements. The GridAgents™ could run locally at the edge of the network to provide autonomous and semi-autonomous coordination regarding hundreds of SmartGrid functions that could virtually replace adding physical hardware, hence, they were deployed in Con Edison’s 3G-System-of-the-Future project. Later, GridAgents were applied to many machine-to-machine (M2M) applications such as Smart Cities, software-defined infrastructure, and e-mobility. Maxim also states that what blockchain brings to multi-agent systems is consensus algorithms for interpreting facts in a trustless multi-agent system. Consensus allows for nodes in the system to be in unanimous agreement on the state of things. Additionally, blockchain creates a permanent memory (immutability) making the vision of multi-agent systems much more complete. I call the addition of blockchain/DLTs to multi-agents system, AI 3.0. 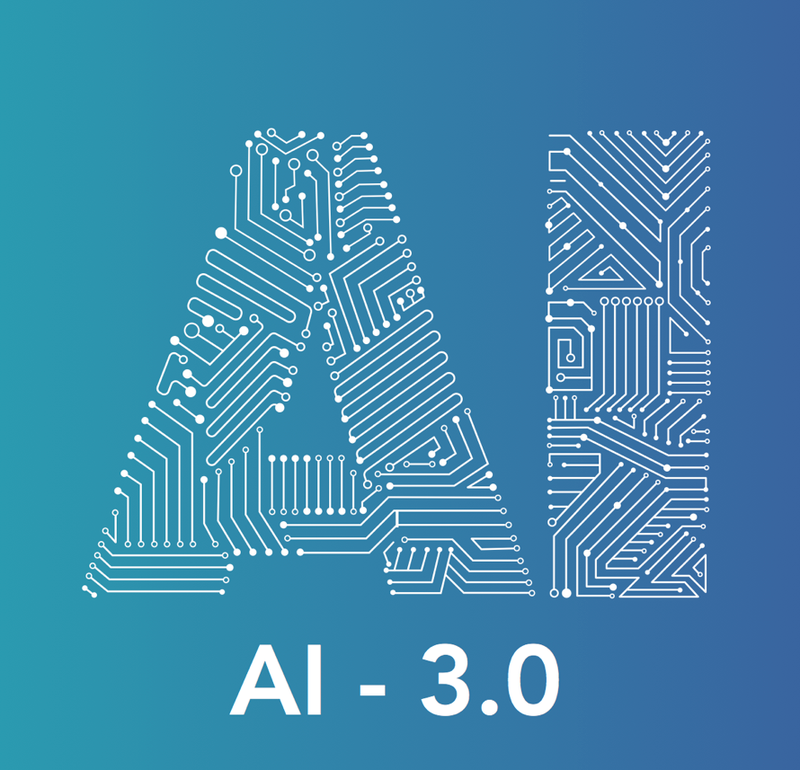 This AI 3.0 combines the benefits of over 30 years of research on AI, machine learning, and multi-agent systems with blockchain and DLT technology to finally enable the emerging industry 4.0 where billions of devices will be connected to the internet and will need to coordinate in real-time at the edge of the network. While traditional blockchains such as that which underlies Bitcoin have gained popularity, many have major scalability issues due to external mining and its impact on transaction costs and in particular, unsustainable energy costs expended in the transaction settlement process. Even so, there is a new category of what is called blockchain-free cryptocurrencies that are designed for different domains that attempt to remedy these scalability issues which use different forms of a Directed Acyclic Graph (DAG) such as DAGCoin, IOTA for IoT applications, ByteBall, and others that are emerging. While these may have found suitable use cases, in evaluating these technologies, I determined that none would meet all of my requirements (scalability, speed, footprint, fault tolerance, cybersecurity, AI integration, communications, etc for initial use in permissioned networks. In my yearlong quest to find the perfect underlying blockchain foundation to build my new software platform funded by the U.S. Department of Energy (DOE) and targeted for mission critical cyber-physical systems, I was lucky enough to be introduced by a friend to industry veterans and Swirlds founders, Mance Harmon and Leemon Baird. Mance explained that the both of them share my deep interest in AI, machine learning, and recently blockchain technologies. When Mance told me that Leemon had invented a new consensus algorithm based on distributed ledger technology, I became very intrigued to say the least, based on their incredible backgrounds in the software industry as well as academic achievements. Leemon Baird has a PhD in Computer Science from Carnegie Mellon University and has built and sold several successful companies. Mance Harmon has a Masters Degree in Computer Science and has held significant roles at Ping Identity. I needed to know more so I did a deep dive and in fact, after studying the hashgraph technology, I became so interested that I joined the hashgraph team. The beauty of hashgraph lies in its efficiency and sheer elegance. Ultra Fast Transactions: with formal results underway. Fairness: Mathematically Proven Fairness via Consensus Time Stamping means that no individual can manipulate the order of transactions. Secure: Bank-Grade Security (Asynchronous Byzantine Fault Tolerant), which precludes bad actors from preventing consensus. Uniqueness: Hashgraph uses virtual voting and gossip about gossip to reaching distributed consensus, which is very efficient, instead of POW or POS. Only time will tell but I am very excited to see the possibilities for hashgraph and other blockchain technologies to enable the machine economy and beyond. With hashgraph, we truly have all the characteristics of a winning technology that can close the gap between the re-emergence of AI, blockchain technologies, and industry 4.0.